Angela Carter writes like no other. 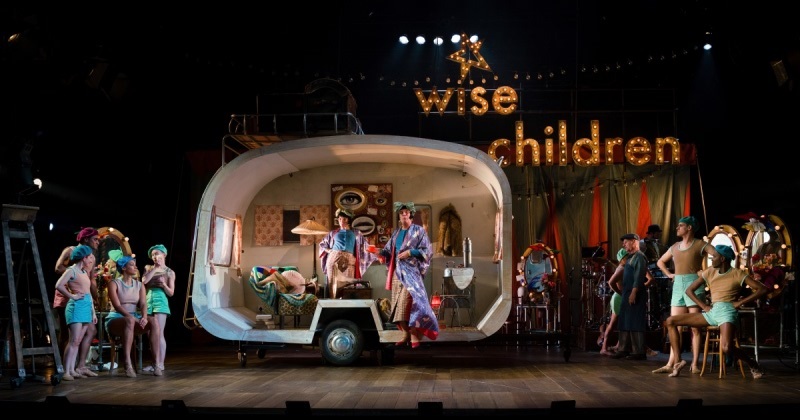 This production directed by Emma Rice is witty, tender, thoughtful, honest, funny, energetic, musical, broad-minded but most of all hugely enjoyable. Wise Children know their father according to Shakespeare’s Merchant of Venice and even wiser fathers know their children. The story is a wild one with Shakespeare at its heart. Nora (Etta Murfitt) and Dora Chance (Gareth Snook), the twin, unacknowledged daughters of Sir Melchior Hazard (Ankur Bahl, Paul Hunter), self-styled ‘greatest Shakespearean actor of his age’ have been brought up by fun-loving, wayward, amazing Grandma Chance (Katy Owen) and the odd cheque from butterfly-obsessed Uncle Peregrine Hazard (Mike Shephard, Sam Archer), twin brother of Melchior. The story, narrated by Dora, on the twin’s 75th birthday and Melchior and Peregrine’s 100th birthday as they prepare for ‘the party’, is told in flashback mostly at 49 Bath Street; Brixton. Various actors play the twins: Nora and Dora at seven and 13 (Bettrys Jones, Mirabelle Gremaud) and as showgirls The Lucky Chances (Omari Douglas, Melissa James). The puppetry of the babies is a clever touch (Lyndie Wright, Sarah Wright). There are gorgeous performances with Grandma (Katy Owen) taking centre stage for me. She runs a bawdy, boarding house for penniless actors and ‘we all rub along’. The characters are larger than life, the eccentrics on the periphery of south London life, way beyond the tracks. In every way Nora and Dora feel illegitimate. Their mother pretty Kitty (Mirabelle Gremaud) dies in childbirth leaving them by default in the care of Grandma with occasional visits from the hedonistic Peregrine. I loved the scene where at Brighton she shows the 13-year-old girls the facts of life with props consisting of a doughnut and stick of rock – I leave you to imagine how that plays out. Music appropriate to the 1940s and onward includes ‘Girls just wanna have fun’ and ‘My heart belongs to Daddy’ with a live band on stage and brilliant – I mean it – violin playing from Melchior’s wife Lady Atalanta (Patrycja Kujawska) and mother to their precocious, diabolical twins Imogen and Saskia.